Have you ever wondered what happens with bridal bouquets when the wedding reception ends? For example, this one has become an awesome mosaics that will make your space blossom all year round. PROs: Handmade tile mosaic decor composed of high-end natural marble that is guaranteed to transform your space. 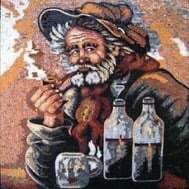 Mosaicist: Haith D.
CONs: May inspire you to tie the knot. Even if you’re already married. This stunning mosaic decor is perfect as a mural for any office, bedroom, living room, dining room or retail space. Our mosaics are made from natural marble and stones, naturally resistant to different environments (dry, moist or wet) and weather conditions (frost, sunlight or extreme heat).